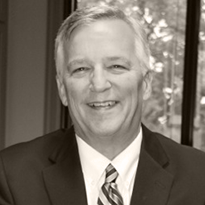 Thad began his insurance career in 1976 working in the claims department for Mid Continent Casualty Company in Tulsa. In 1978 he joined his family agency, Carl M. Leonard & Son, Inc., that was founded by his grandfather in 1941. In 1992, he bought out his father and became president of the agency. In 1994, Thad helped form and grow Bains West, Inc., a large regional cluster of independent insurance agencies and served as Vice President, Treasurer and was a Director of the Board. Thad joined Rich & Cartmill through the merger of his agency in 2014. Thad’s commercial insurance business is focused on areas manufacturing, energy, physician, medical and other types of commercial insurance. For the last 30 years, he has also focused on insuring high net worth individuals, high valued homeowners, art and jewelry collections. Thad has been a leader in the Oklahoma insurance industry. He has served on the board and as President of the Independent Insurance Agent of Greater Tulsa. Thad has served on the board of the Independent Insurance Agents of Oklahoma and the Young Agents Committee of the Independent Insurance Agents of Oklahoma. He served on the Executive Board of the Independent Insurance Agents of Oklahoma and as Chairman of the Board in 2016. In the Tulsa community, he has served on the boards of Ronald McDonald House, Thornton Family YMCA, Boston Avenue Methodist Church, and the Carnegie Elementary School Foundation. Thad is an avid fly fisherman and quail hunter. Thad and his wife of 41 years, Susan, enjoy traveling, hiking in the mountains and spending time with their three children and four grandchildren.